If you frequently need to move chairs from one room to another, or if you need to store them out of the way, consider a chair that is easy to stack. Stackable chairs come either with separate backs and seats (two-piece) or with the seats and backs combined (one-piece). The difference is more aesthetic than it is functional. 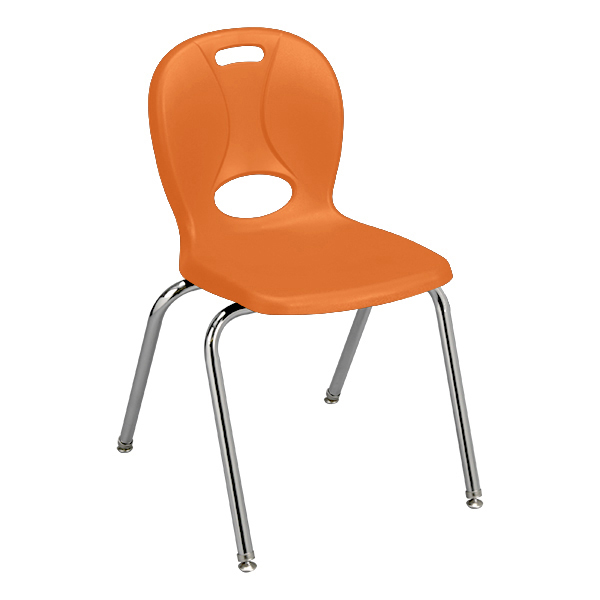 School chairs usually come in one of three seat materials: soft plastic, hard plastic or wood. Soft plastic school chairs, sometimes called polyethylene, polypropylene, K-resin or anti-static plastic, are lightweight and easy to move around the classroom. The relative softness of this seat material offers more flexibility and better contouring to body posture than other chair materials, offering a more comfortable seat for both kids and adults. Soft plastic chairs tend to be a better bargain than hard plastic and wood chairs, and they have become the chief type of school chair in classrooms around the country. Though they may sometimes be susceptible to gouging or cutting, you can rest assured that the chairs will last for years without a problem. Hard plastic school chairs, also known as resin or thermoset plastic chairs, are strong enough to handle all of the daily abuse found in a typical classroom. The mixed resin material won't fade, warp or otherwise show signs of wear, though the durability comes at the cost of lesser comfort. In general, hard plastic chairs are more expensive than soft plastic school chairs, but they do have a better resistance to cutting, gouging and other damaging activities. Wood school chairs are very strong and look nice in your classroom. Wood school chairs are usually considerably more expensive that hard plastic and soft plastic chairs. Still, some prefer the classic look and durability of wood chairs. Most school chairs have a chrome or powder-coat paint finish on the steel frame. Chrome is the shiny silver finish that most of us remember on school chairs that we once used. Powder-coat paint is sometimes available in several different colors, so you can best match the décor of your classroom. Both finishes are extremely durable, so your choice is a matter of taste. Wheels - In some situations (such as labs), students move frequently between work stations. In those instances you might consider a wheeled chair. Glides are typically either plastic or steel. Some people prefer steel glides for the chairs they use on carpet, but we find that nylon glides also work very well. Nylon (also called plastic) glides tend to be a little less noisy on hard floors. Glides keep your chair level and prevent scratches on linoleum or tears in carpet. Sled bases – Some chairs are also available with sled bases that move easily on carpeted surfaces. Cantilever chairs are a modern, sleek alternative to traditional classroom seating. These chairs glide easily over carpet and most provide ergonomic back support. A few cantilever chairs even provide the ability to moderately rock. Many manufacturers offer optional bookracks (also called bookbaskets) that attach beneath the seat. They're a great way to keep books off the floor and out of the aisles. 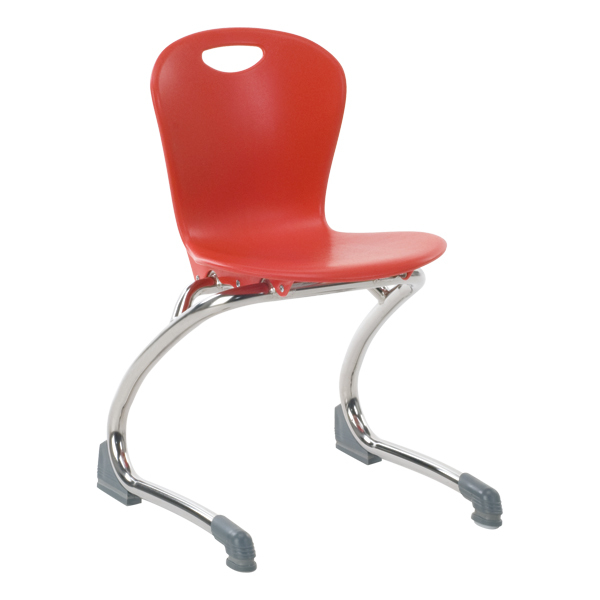 Some manufacturers' chairs are available with slightly shorter front legs that make them ideal for students playing instruments. This optional feature is called a "band pitch." Still not sure which school chair is right for you, or want suggestions on desks and tables to go with your school chairs? Give us a call 1-800-260-2776. Our friendly sales team is happy to assist you.